Kill your speed or kill a child. This page seeks to examine the claim that drivers exceeding the speed limit are automatically risking the lives of children. We don't really have any big worries about the general claims about the proportions of folk injured at these impact speeds. But ask yourself how they found that 20% of folk were injured at 10 km/h. Did the other 80% turn up and say they were struck at 10km/h, but they were uninjured? What? All of them? Or did they crash a car into 100 medical students at 10km/h and examine the results? Probably not we guess. Can anyone suggest any practical technique for establishing the 20% of folk receiving minor injuries at 10 km/h? new Graph of risks of different risks of injuries to a pedestrian struck by a car at various impact speeds. If someone is hit by a car at 40 mph they are 90% likely to be killed. If someone is hit by a car at 30 mph they are 50% likely to be killed. If someone is hit by a car at 20 mph they are 10% likely to be killed. And note the following: Child fatalities were up 14% in 2001 compared with 2000 figures. The report from which these figures were extracted can be downloaded direct from the government's new dft web site. We have not been selective in choosing the figures. Which shows that (for example) 65% of cars at sample sites exceed the 30 mph speed limit with 32% exceeding 35 mph. Taken at face value it appears from the government claims that reducing speeds by a few miles per hour might save half the dead pedestrians. We do not doubt the claim of the proportions of deaths at various impact speeds. We do not doubt the casualty figures. What do have to take issue with is the implied relationship between vehicle speeds and pedestrian impact speeds. Relatively few collisions between vehicles and pedestrians take place. When there are collisions, in most cases excellent avoiding actions will have been taken by most drivers and this has an enormous effect on the speed of impact. Average traffic speeds in 30 mph zones are still something over 30 mph. The Government would have us expect to see more than half the pedestrians in accidents killed. But the truth is that around 2% are killed, and only 0.7% of children. This is simply because in most cases drivers are able to brake to much lower speeds before impact. And that's not the only problem with the figures. We simply don't know what proportion of the pedestrian casualties took place in 30 mph speed limit zones. While we know that the vast majority of accidents involving pedestrians take place in town, it is very likely that out of town pedestrian impacts have a higher proportion of fatalities. It's only reasonable to conclude that significantly less than 2% of all pedestrians and significantly less than 0.7% of child pedestrians are killed in 30 mph zone accidents. new And what about unreported minor collisions without any injury? And what about near misses? We might guess that unreported minor collisions could double the injuries figure. If avoidance is the issue, which it clearly should be, then the near miss count is very likely to be five times greater still. So if we factor in sensible guessed figures for unreported minor collisions and near misses we could reasonably guess that 0.07% of child pedestrians in "incidents" with cars are killed. Pedestrian deaths will also be disproportionately represented in cases where drunks, joyriders and escaping criminals crash in pursuit of their activities. Obviously restrictions of or advice to normal responsible motorists will have no effect on these dangerous behaviours. So that's yet another reason to downgrade the effective percentage killed figures when considering changing driver behaviour. Accidents where the vehicle was within the speed limit to start with 0.3 70% of the accidents take place with vehicles travelling within the speed limit. new After considering these factors, we calculate that rather less than 0.02% of child pedestrians involved in incidents with vehicles are killed in circumstances where speed enforcement might possibly have been able to make a difference. new So the government chooses to imply 50%, and the truth is somewhere well below 0.1%. I think we can safely conclude that the government's implied claim is out by a factor of more than 500. To say that the government's claim is deliberately misleading is something of an understatement. new So next we take our very pessimistic 0.1% figure and attempt to apply it to the graph above to derive an average impact speed. Obviously the graph lacks resolution for this purpose. In fact we can't read a speed from it at all. But it's very low indeed: 1 or 2 mph perhaps. And don't forget the average free flowing speed of traffic in 30 mph zones is still over 30 mph. new Or look at it another way: We estimate a total of about 160,000 incidents and as a result only 107 child pedestrians were killed. We suggest (as a minimum estimate) that in 30% of those incidents the vehicle was exceeding the speed limit when the incident began. Where's the evidence for "speed kills" in these circumstances? Don't bother to look too hard: There isn't any. The whole idea is rubbish. Let's compare different cases of a scenario which we believe to accurately represent the real world. It is a built up area. A 30 mph speed limit applies. We have an average driver in an average car. A pedestrian suddenly steps into the road (from a previously hidden position on the left) 100 ft ahead of the car. We've calculated braking distances based on standard physics equations and an assumption that a car with modern brakes and tyres will slow at about 0.85g. This assumption is reasonable. The car is being driven at 35 mph with full attention focused ahead. The driver takes about 0.75 seconds to recognize the danger and start braking. During this period the car moves forward 39 feet. The car's brakes are applied with full force and the car stops in 48 feet. 87 feet have been covered by the car and the pedestrian at risk is still 13 feet away. The car is being driven at 30 mph. The driver is half way through making a speedometer check when the pedestrian steps out. (It is known that speedometer checks take about 0.8 seconds.) During the remaining 0.4 seconds before the driver refocuses ahead the car travels 18 feet. The driver takes about 0.75 seconds to recognize the danger and start braking. During this period the car moves forward 33 feet. The brakes are then applied with full force and the car stops in 36 feet. 87 feet have been covered and the pedestrian is still 13 feet away. This time we have an inattentive driver and the car is being driven at 30 mph. The driver takes about 2.0 seconds to recognize the danger and start braking. During this period the car moves forward 88 feet. The brakes are then applied with full force and the car slows for just 12 feet before impact with the pedestrian. The speed at impact is over 24 mph. An advanced or experienced driver approaches the danger area. The driver recognizes the inherent danger of the hidden area (from which the pedestrian in our examples emerges), and reduces speed. (Our driver probably positions further right too, giving more space, but that's a completely separate issue.) From the reduced speed, when the pedestrian does step out our advanced driver is easily able to avoid a collision by gentle braking. As for slow down messages and further increases in speed enforcement we think the benefit of driving a couple of miles per hour slower will be entirely negated by a) reduced attention from the driver in general and b) the enhanced risk of driving blind while more speedometer checks are made. Case 1 and Case 2 above illustrate the point. Driving at 5 mph over the speed limit tends to make little difference in the real world. There's also the risk that present road safety strategies are making drivers less attentive to the road ahead. They might be concentrating on the speedo, looking for roadside cameras, or their attention level might have dropped due to a lower speed. We risk changing Case 1 drivers into Case 3 drivers. 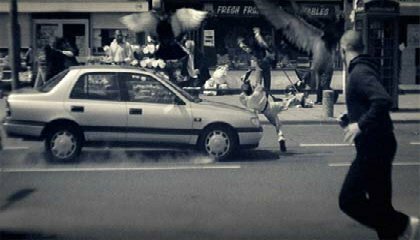 Case 3 show how easily dangerous collisions can be caused by inattentive drivers. We should have policies which identify inattentive drivers and punish their inattention. If the inattention cannot be cured then these are the ones that need to be banned from driving in the interests of road safety. Case 4 illustrates the ease with which skilled or advanced drivers can usually avoid such accidents. We continue to demand better education and higher standards for all drivers. Nothing is these notes should be taken as condoning driving too fast for the conditions. Good control of speed, coupled with good observation and concentration are the best tools for avoiding collisions of all types. Inexperienced drivers frequently lack "good hazard perception". While the inexperienced are developing their hazard perception, keeping speeds down really does help safety. The risks associated with more frequent speedometer checks are potentially much greater than you might think. Suppose (for the sake of simplicity) that a speedo check takes 1 second. Suppose in less regulated times a driver made one speedo check every 60 seconds, and suppose that same driver now checks his speedo every 15 seconds. We've gone from a 1 in 60 risk to a 1 in 15 risk that a speedo check will coincide with an incident ahead. This coincidence will always delay the driver's response to the incident, and I think it's clear from everything above that the driver's response is the real key to avoiding collisions and reducing their severity. So what difference will delaying the driver's response by one second make to the speed of impact? In full panic braking you can expect to lose more than 18.5 mph every second. (yes, this is true from any speed, every second of full panic braking will shed another 18.5 mph). The time taken for a speedo check is largely due to the delay while the eye refocuses more closely and then further away again. This refocusing period increases with the driver's age. Estimates of speedo check durations always seem to be in the range 0.75 to 1.0 seconds. We've so far been unable to find any research on how much longer it might take older drivers to check the speedo. We must not blindly assume that the probability of making a speedo check at a critical instant is in direct proportion to the total time spent making speedo checks. An experienced driver will choose to make a speedo check only at those times when he considers the scene ahead is constant enough and predictable enough to do without his attention for a short time. However, since accidents frequently follow failures of drivers to predict changes ahead, we're not sure of the importance of the effect. According to various reports it isn't usually drivers causing accidents involving pedestrians. For example the West Midlands Accident Review (click here) has it that in 61% of cases the pedestrian simply "stepped, walked or ran from the foot path".